It all started with my trip to Anthropologie. I found some fabulous wall hooks and knew exactly where to put them! Although it took a few weeks of internal debate, I finally got them hung in the entryway. 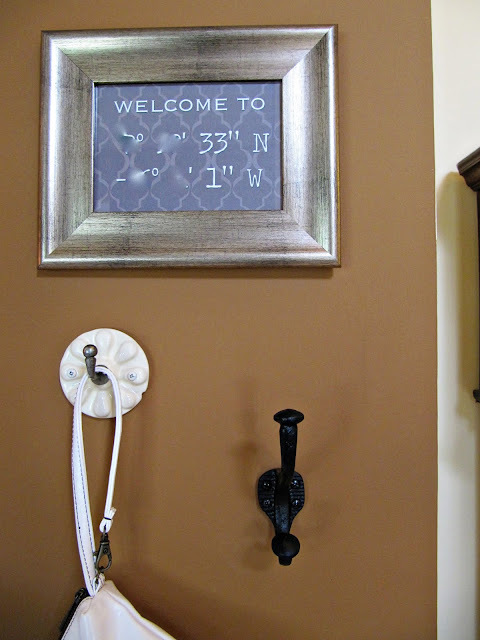 I was inspired by a coordinates sign I saw on signals.com and the lovely wall stenciling that has been popular in blogland lately. I whipped up this sign and found an unused frame to match. 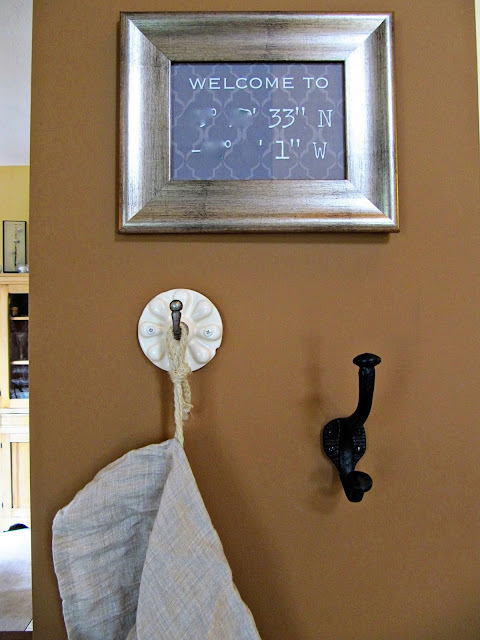 Here is the quick fix that adds just a bit more to the entryway! I am loving it so far! 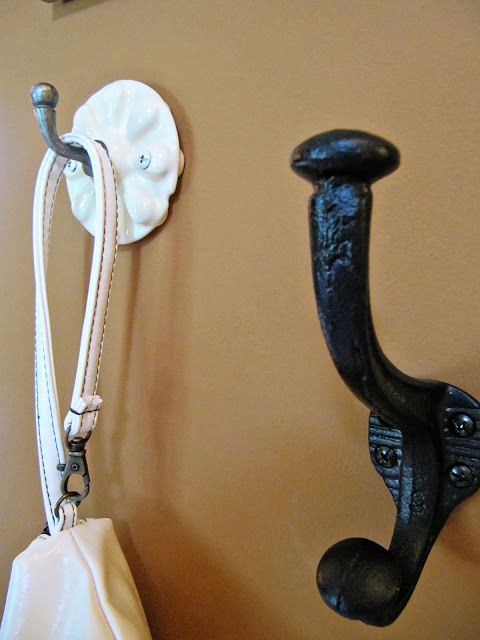 What small touches have you added to your home lately? How great is this?! Love the idea and it looks fabulous! Love it! I showed my hubby and we are totally doing this :) You just posted your exact address on the web though, be careful! @Catherine...it had crossed my mind after posting yesterday. Thanks for stopping by!! Very fun. I love the lat/long sign. how fun! thanks for partying with me! This is so cute and clever!! Love the whole look here! I love these. What an awesome sign. I would love for you to link up to my feature Friday linky party. Super cute, love it! Thanks for linking up! Looks great, a small touch but a big impact :) Thanks for sharing at Beach Cottage Good Life Wednesdays. Love it! Thank you so much for linking up! I love the hardware! Thanks for sharing! Hi, Alyssa! You've got so much creativity and I'm admiring them all. Can you please share your creative posts at the Creative Bloggers' Party & Hop? Hope to see you there at the party :). Btw, I also have a blog party called Market Your Biz and Giveaways so please feel free to link up your online shop and giveaways on Tuesday at 5 pm. 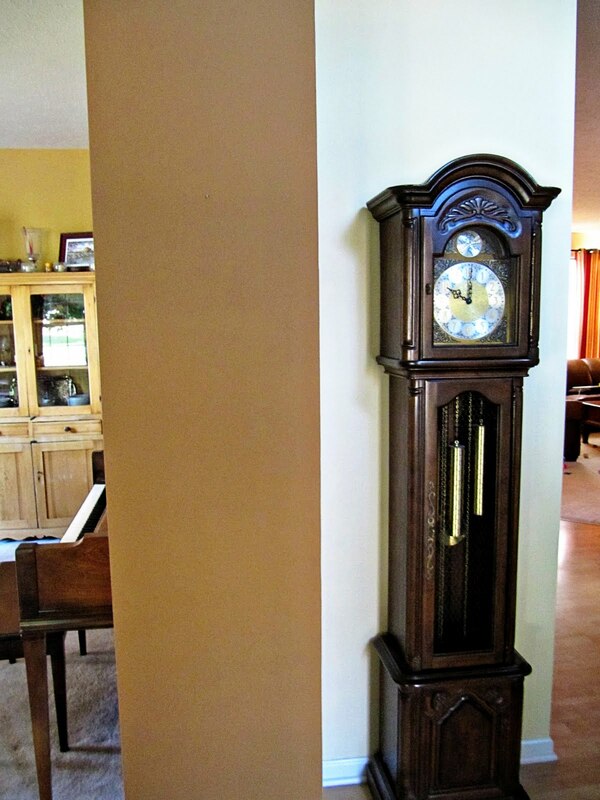 I love the eclectic look! 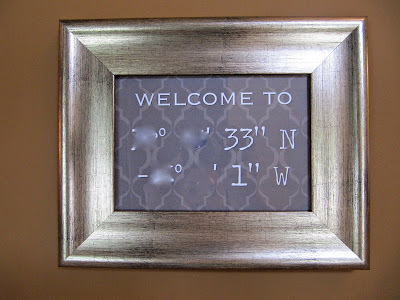 And the fact that you made your own coordinates sign too! such a lovely decor items, Alyssa! thanks for sharing it with us. we love it so much we are featuring it today and you also qualify for August's finest Week 2. votation starts today, do grab the featured button if you fancy so. Have a lovely weekend!